Raspberry Peach Champagne Jam - Besides being a delicious mainstay at the breakfast table, this blend makes a splendid filling for shortcakes or crepes topped with whipped cream or vanilla ice cream. The refreshing taste of summertime is perfectly captured in this unique Stonewall Kitchen raspberry peach champagne jam. Garnish a cheesecake or mix into brownie batter before cooking. 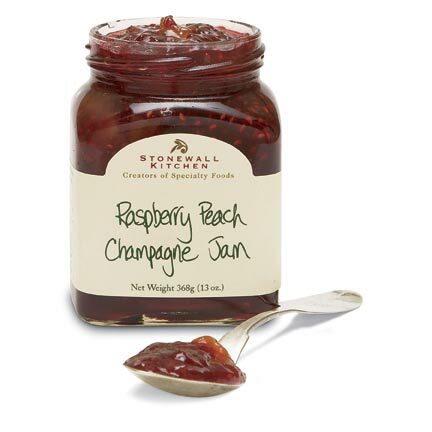 Stonewall Kitchen Raspberry Peach Champagne Jam.